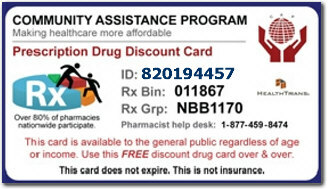 Get your FREE prescription drug discount card You can save from 10% to 85% on the cost of both brand name and generic prescriptions immediately. There are no claim forms to fill out and no limits to the number of times you or your family can use the card. Medicare drug discounts are available only at participating pharmacies. The Pharmacy Discount Program provides discounts for its members at certain participating pharmacies for drugs and other healthcare supplies. You can also save on smoking cessation aids and diabetes supplies. These savings are based on the fact that we have over 56,000 pharmacies processing millions of prescriptions annually. New Integrated Employment Toolkit: This new online toolkit from the U.S. Department of Labor’s Office of Disability Employment Policy’s (ODEP) includes discussion guides and answers to frequently-asked-questions for people looking for jobs, employers, community employment agencies and others. Integrated employment places both youth and adults in regular jobs in their communities, along with any needed supports, so they can earn a decent wage. In an integrated employment setting, most of the employees are not persons with disabilities.